One of the most explosive back-row operators in the northern hemisphere, Wallace made his Ireland debut against Argentina in 2000 - following in the footsteps of his brothers Richard and Paul. In 2001 he was selected for the British & Irish Lions tour to Australia, but did not manage to make it into the reckoning for a Test match place. His progress was subsequently hampered by a series of injuries, and he flitted in and out of the Ireland team until 2006. He earned a recall to the Ireland squad in 2005 on the back of some impressive form for Munster and went on to start every game of the following year's Six Nations before helping his province to the Heineken Cup crown. Arguably the best openside in Europe since at this time, he featured in a lacklustre Rugby World Cup campaign in 2007 before securing a second Heineken Cup title with Munster in 2008. He was a key figure in Ireland's Six Nations Grand Slam in 2009 and was rewarded with a place in the British & Irish Lions squad for that year's tour of South Africa. He saw off the challenge of Wales' Martyn Williams to start the first Test match against the Springboks in Durban and retained his place for the second clash in Pretoria. He won his third Lions Test cap as a replacement in the 28-9 third Test victory in Johanesburg. 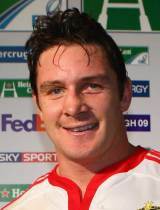 Wallace continued to play a central role for Ireland and on his 200th appearance for his province, he produced a man of the match performance to help Munster clinch the 2011 Magners League title after beating Leinster in the Grand Final at Thomond Park. He won another fitness battle to earn selection for Ireland's 2011 World Cup squad but saw his tournament hopes dashed by another knee injury suffered during his side's final warm-up clash against England. He battle back to fitness and returned to provincial duty but was eventually forced to call time on his career at the end of the season.